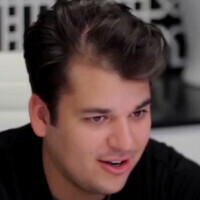 So what does Rob Kardashian have to do with T-Mobile? Apparently, Kim's brother has started his own line of socks (the heel!) and T-Mobile had him film a video clip talking about pairs. The point being that T-Mobile is Mr. Kardashian's carrier, although judging from the expression on his face, we're not too sure that the sock mogul knew what was going on. At one point in the clip, host Michelle Marie is asking Kardashian to say the first thing that comes into his mind when he hears certain things. She says, "wireless plans with no contracts and..." and Rob says T-Mobile in such a way that you know he wishes that he were ten thousand miles away. Will anybody really switch to T-Mobile because Kim Kardashian's brother is supposedly a customer? As long as we're playing this game, which celebrity or sports star would you follow to another carrier, and why? Just drop us a line in the box below. Well apparently PhoneArena is in their "fans" group. I'm with you, though, I can't stand them; I've never watched their stupid show, I change the channel when one of the "K"lan is featured in a news segment and the biggest skank of all has got to be the one who gave birth to all of them. I buy socks from Nike or Under Armor... You know people in the clothing business, not some brother of a famous dumb family. worst commercial of all time? Watching that poorly scripted commercial made my eyes and ears bleed. You could see the desperation and discontent in body language and hear it in his voice.